N GP-38 Locomotives - New Paint Schemes! N GP-40 Locomotives - New Paint Schemes! N GP-40-2 Locomotives - New Paint Schemes! By the beginning of WWII, the majority of the classic USRA double-sheathed box cars and their clones were rebuilt with steel sides. More rebuilds followed in the late 1940s and early 1950s. By late 1948, close 14,000 of the original 24,500 USRA double-sheathed cars had been rebuilt with quite a degree of variation including the end, door and underframe. These steel side rebuilds were far more popular than their single-sheathed counterparts and make a great addition to the Atlas N scale product line. 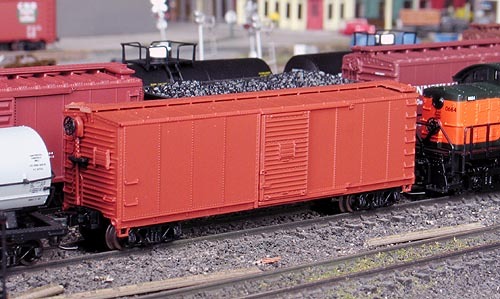 N Steel Rebuilt Box Car - New Model! N 70 Ton Hart Ballast Car - New Paint Schemes! Pulpwood is not a specific type of wood, but actually tree limbs that are cut to a specified length, then turned into wood pulp and used in the paper industry. Early paper making had the trees near the paper plant. As timber resources were diminished, the need for transporting pulpwood began to rise. Railroads were seen as an efficient method of transporting pulpwood. Pulpwood in the Southeast and Northeast is generally cut into four-foot or less lengths and loaded onto "V-deck" bulkhead flat cars. The Atlas pulpwood flat is a reproduction of an early 1950s General Steel Castings "V-deck" design. N Pulpwood Flat Car - New Road Numbers! N Pulpwood Flat Car - New Paint Schemes! Atlas' preview of the highly anticipated Code 55 #10 Turnout has already caused a stir in the N scale market. Designed with precision technology, bears the detailed prototypical appearance along with the guaranteed reliability that are the hallmarks of Atlas Code 55 track products.